If you’re going to travel, travel in style. That means taking the means to make your own cocktails with you. 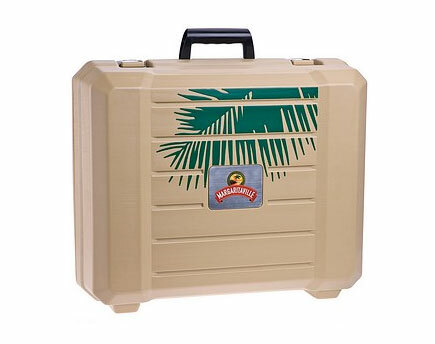 And if you happen to have the Margaritaville Battery Powered Frozen Concoction Maker, the only way to go is with this Margaritaville Travel Case for DM0900 Series. All the details on this finery in the product description below. Ice not included. Take the party with you! This rugged plastic hardcase is designed to store, protect and transport the Battery Powered Frozen Concoction Maker DM0900 series to whatever latitude you desire. It sports a sturdy handle and a stainless steel latches to secure the Battery Powered Frozen Concoction Maker when its time to pack up the party. The hardcase has individual molded in locations to hold the Frozen Concoction Maker with a battery, the charger and an extra battery. Constructed from durable blow molded plastic, with fun Margaritaville design and details make this hardcase a conversation starter before you even fire up your Frozen Concoction Maker!